Bonnaaa What? Bonnaaaa Who? Bonnaaarooooo. Thom Yorke will you be my valentine? Keep the chocolates, the flowers, and the teddy bears. I got everything i need this valentines day. 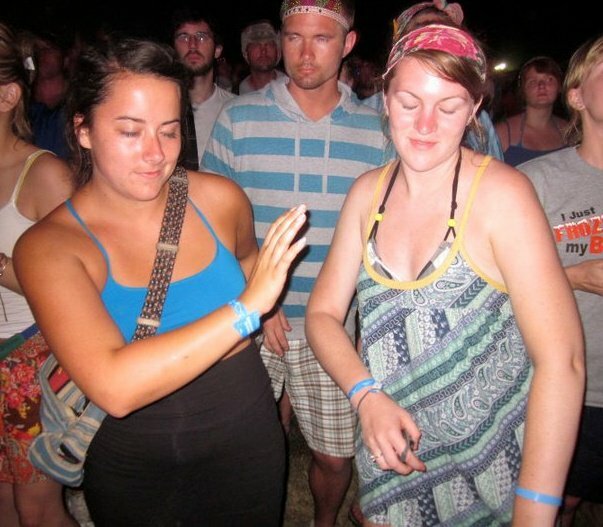 The Bonnaroo Line Up came up today. With bands like Radiohead, Red Hot Chili Peppers, and Phish leading the line up this is going to be an amazing festival. Not only are the headliners amazing this year the little bands make it more than worth it to buy a ticket to go to the festival. Bands like Childish Gambino, St. Vincent, The Civil Wars, Dawes, The Black Lips, and Alabama Shakes would have me buying a ticket to the farm without question. 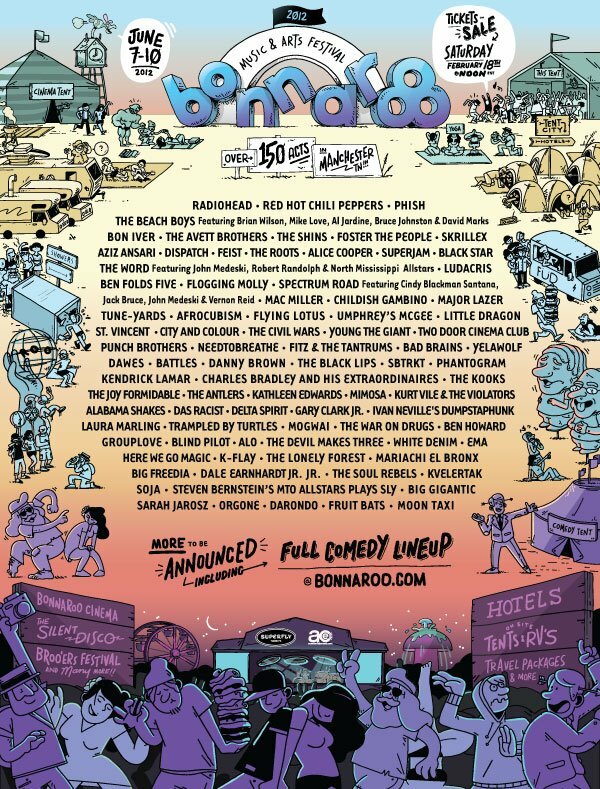 Bonnaroo has been around for 11 years now and this is one of the greatest lineups I have ever seen. The headliners are a perfect mixture between jam bands, indie rock gods, and good ole fashion music (THE BEACH BOYS). 2 years ago was my first year attending bonnaroo and I was sold.Bonnaroo is such an amazing experience that I will probably be attending for years and years to come. I love all the music you can see in one weekend. The fact that i can walk from Beirut to The Strokes to Explosions in the Sky is worth more than the ticket price. The sweltering heat, the dust, the dirt, the druggies, the drunk people that literally sit on you, and even the people that accidentally burn your face with a cigarette cant keep me away from this lineup and this weekend in Manchester, TN. The line up came out today on Spotify. @SpotifyUSA was in charge of the twitter feed along with @Bonnaroo and @ACentertainment. All three companies did not have to promote the announcement for a long time. Once the lineup was released it flooded all social media sites like a wave. I was in class freaking out about homework and tests when the lineup came out this year. This is the first year i have missed the lineup release and I am upset about it. I am usually staring at my phone and computer all day waiting for it. Little did i know it came out in my 11 oclock class. With four tweets, 6 text messages, facebook posts, and a phone call waiting for me on my phone I was too overwhelmed to deal with the information and to talk about it with my friends about their reactions. After turning all my papers, drawings, and taking a test i can finally process the lineup and give you my feedback. So to all my friends I ignored I am sorry and here are my thoughts. SO GOOD. THE LINEUP IS PERFECT. RADIOHEAD. I CANT WAIT. I AM BUYING MY TICKET AS SOON AS I HAVE THE MONEY. RHCP. I CANT WAIT. PHISH. JUNE 7-10 CANNOT COME SOON ENOUGH. THE AVETT BROTHERS. I WONDER WHAT SHOWS WE ARE GOING TO SEE. FEIST. I WONDER WHERE WE WILL CAMP. BON IVER. I WONDER WHAT CRAZY THINGS WILL HAPPEN TO US WHILE WE ARE AT THE FARM!